Below is an end of cruise summary of the catch data from the 2007 SEAMAP Summer Shrimp/Groundfish Survey. The entire survey occurred from June 4 through August 3, 2007 and 307 trawl stations were sampled during the survey. In addition, vessels collected ichthyoplankton data with bongo and/or neuston nets. All vessels recorded environmental data, including temperature, salinity, oxygen, and chlorophyll at each station. 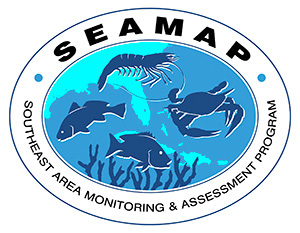 Catches of shrimp and finfish were reported weekly from all SEAMAP participants. The attached plots summarize the catch rates from the entire Summer Shrimp/Groundfish Survey.